Forum Index > Historical Arms Talk > The Difference Between a Messer and a Falchion? I think what probably sparked the idea in Jean and myself was the odd curves of these particular examples and especially the one curving forward. Two other explanations for a "literal translation" of the picture occur to me. One being they are curved to keep the sword in the picture, the artist assuming this would be understood by the viewer (though I do not think this likely as there are others in the picture that seem to be closer to the edge and would need the same treatment but are straight. The second option maybe an illustration of these two particular individuals being "hero" enough to have bent their swords with mighty blows? Neither seem that great a reason to show what is illustrated, but are possible. The depiction of them detailed as the other swords but with the odd curves seems to be an interesting conundrum. Again I have to say great detective work on the images and sources. Really helps the discussion and a good examples for those who think the web was no good sources. Might you be able to add the falchion and messer to Kirk Lee Spencer's "Possible Line of Development From Pole Axe to khopesh to Kopis to Seax to Viking"? I just got back from Israel and was catching up on what I had missed. I was working through this marvelous thread and came upon this question... well it is interesting that you ask because I did extend the diagram from the Egyptian pole axe to the military sabers still carried by the honor guard. As I have said before... it is really an excercise in design and may or may not have any historical validity other than the fact that they appear in a certain sequence in time. Whether these forms are connected by cultural migration or cause and effect is less certain. I have attached the diagram. 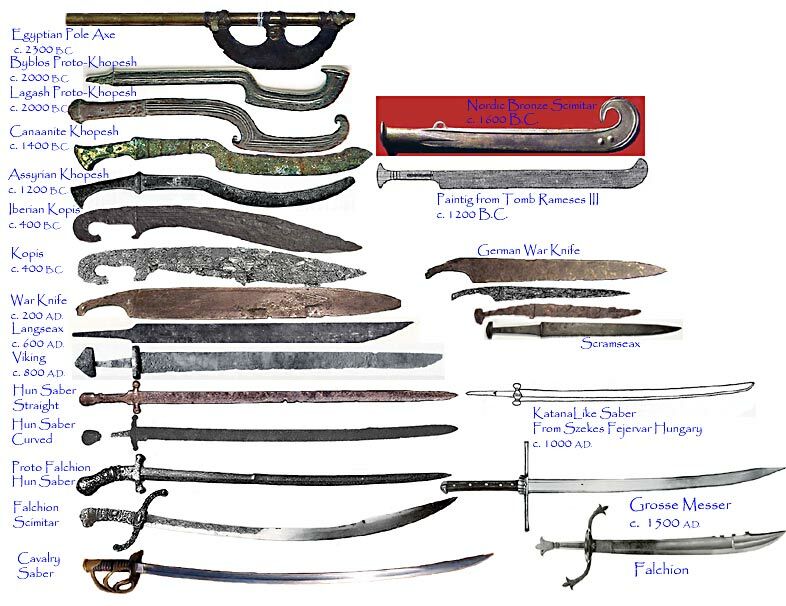 It also shows, to the right-hand side, some of the off shoots, such as Nordic "Scimitars," seaxs, katana-like Hun saber and messers all mentioned at different times in this thread. If you are interested in the very early development of "sabers" (curved single edged swords), you should also look at the First Saber thread. Two other explanations for a "literal translation" of the picture occur to me. One being they are curved to keep the sword in the picture, the artist assuming this would be understood by the viewer (though I do not think this likely as there are others in the picture that seem to be closer to the edge and would need the same treatment but are straight. The second option maybe an illustration of these two particular individuals being "hero" enough to have bent their swords with mighty blows? The thought of the possibility of the artist curving the swords to fit the picture had crossed my mind, but like you said, it would only explain some, not all. I like the idea of the individuals possibly being "hero" enough to bend their swords, but again, it might only explain some. I also wondered, at least with the one sword with its tip bent into a hook, if some of these were meant to represent damaged swords. I know several illuminations of battle scenes show broken weaponry littered across the ground. I wonder if some of this might be an extension of that idea; show the swords being damaged as they are being used hard by "heroic' warriors. 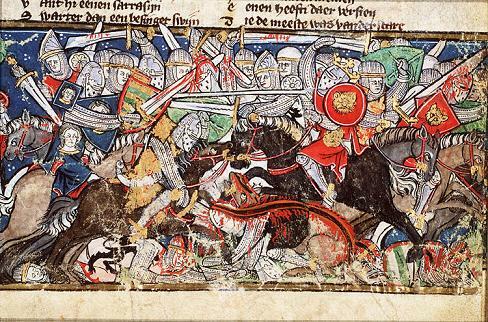 My guess is that there is no one straight and fast answer to why some medieval illuminators chose to show curved swords in some of there images. The likeliest answer is all of the above! There are some good resources on the net; one just has to know where to look! Right here is a good place to start, but there are several sites that have images from medieval manuscripts on-line. The British Library is perhaps the best, but there are others as well. 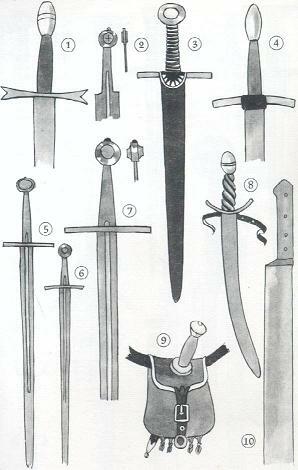 Even if there isn't necessarily a direct historical link between all these curved swords, they are definitely related by form. Your diagram is certainly interesting, and it makes one wonder if there is a connection through time. Thanks for the extended diagram. It certainly is interesting to see that the falchion and messer are in quite a bit of artwork. Prior to the picture posted here, I've really only seen a handful of depictions of these weapons. Out of simple curiousity, are the artworks here from anyparticular area or all over europe? if they are mainly from several specific parts, that would say that the falchion would have been most prominent in these areas, correct? Notice number 7 in the first plate (Plate 3, Part V). It is a soldier's falchion, dating from about 1380 from the Ressurection by the Master of the Trebon Altarpiece. Also notice number 11 on the same plate. It is a soldier's knife dating before 1400 from the St. Barbara Crucifixion. This knife could be called a messer (which is what messer means, really). In plate 9 part V, note numbers 8 and 10. Number 8 is a soldier's sabre dating from about 1430 from the Skalice Crucifixion. 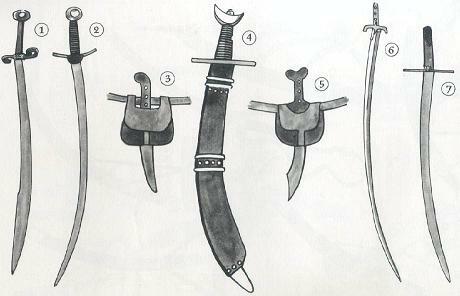 Number 10 is part of a falchion from the Badra fortress. The blade is 46.4 cm long and 5 cm wide. With it's "knife" hilt-form, this could also be called a messer. Note all the weapons in plate 12. Number 1 is St, Bartholemew's falchion from Jan of Jeren's epitaph of 1395. Number 2 is a detail of the same weapon. Number 3 is a falchion from the Zaton altar-piece dated 1430. Number 4 is a falchion fom the King Wenceslas Bible. Number 5 is the knife in the painting of the Madonna with St. Bartholomew and Margaret dating from about 1400. 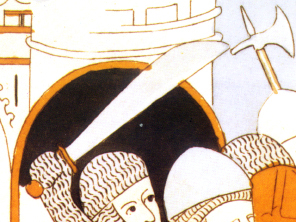 Number 6 is a soldier's sabre from the Rajhrad altar-piece painting of the Carrying of the Cross, dating prior to 1420. Number 7 is a falchion dating from about 1430 from the Hyrov votive altar piece, "The Madonna with the Donors". Number 8 is a falchion from the Rajhrad altar-piece painting of the Ressurection dating prior to 1420. 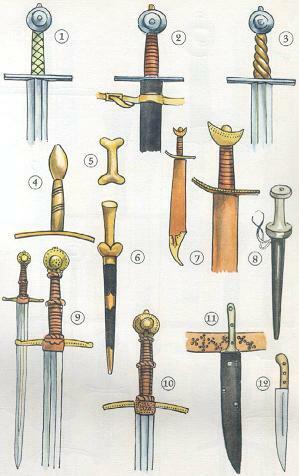 Numbers 5, 6, and 7 may be called messers based on their hilt form. 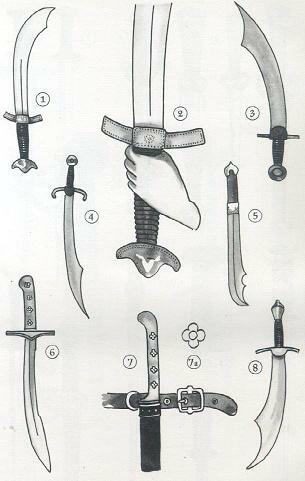 And finally, note the weapons in plate 13. Number 4 is a falchion from the King Wenceslas Bible. Numbers 3 and 5 are knives and pouches from the same source. And, the others are sabres from various sources, most dating to the 15th century. So, falchions/messers seem to have been used over a good part of Western and Central Europe. Plate 3 Part V from Medieval Costume, Armour and Weapons. Plate 9 Part V from Medieval Costume, Armour and Weapons. Plate 12 Part V from Medieval Costume, Armour and Weapons. Plate 13 Part V from Medieval Costume, Armour and Weapons. 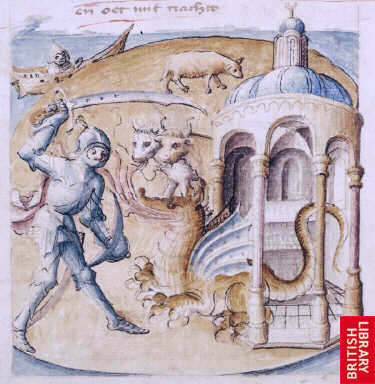 I've found more images of falchions from manuscripts in the National Library of the Netherlands. One is from a manuscript I already posted some images from, The Hague, KB, KA 20, Jacob van Maerlant, Spieghel Historiael. 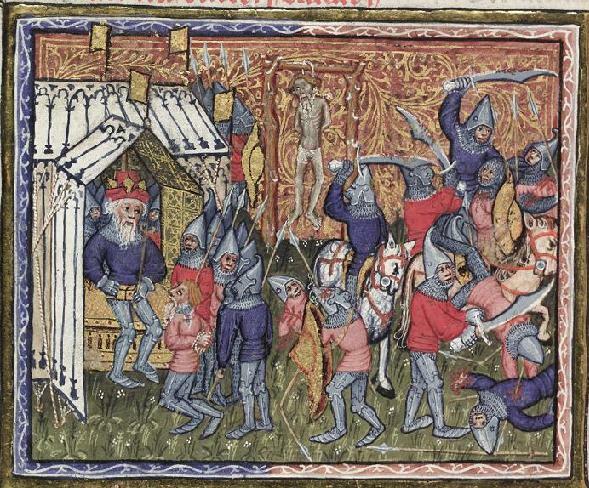 Note the interesting falchion raised in the left-hand side of the image. Note that falchions seem to predominate in the image of the "Battle between the Carthaginians under Hanno and the Romans". Is this an attempt by the illuminator to make them look "exotic"? 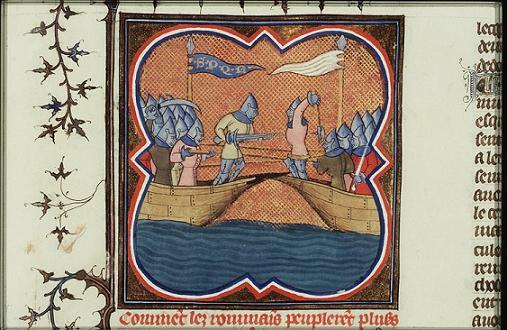 Also, note the "beaked" falchion in the image of "Alexander the Great's campaign against Syria; he fights the nobles of Darius at the river Granicus". This would be a later appearance of this type than the image from the British Library. know im new here but i thought i would chime in. gross messer means big knife and was originally the standard 1/8-3/16 blade, single edge, and about 2inch wide. it was literally a big version of a hunting knife and was originally (acording to a couple sources) meant as a hunting sword. the low cost and ease of carry made these so popular in germany that the original intention was lost. the blades were about 20-36 inch and flexible with a straight quillon. 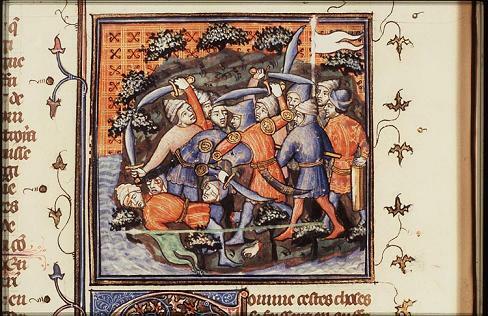 the falchion was taken up by archers, cannon, artillary. and most of the rear echelon as a tool/backup weapon. a 1/4 inch thick stiff blade blade 2-3 inches wide with an s-shaped quillon was basically an ax/machete used to clear brush and make steaks before a battle. this was a "duh im gonna smash you" weapon when the lines engaged for those that had little or no sword training. this weapon would generally break bones under armor rather than make cuts and stabslike a messer. it was also known to sever limbs from tree and man quite easily. in modern times the messer grew shorter and heavier and the falchion lighter and swifter so they have kinda melded. By a falchion taken up by rear echelon troops, are you referring to the pioneer sword with the saw-back issued to sappers in the late 18th and 19th centuries? These are rather falchion-like, and could be seen as a falchion relative. Eduard Wagner and the Diagram Group both equate the blade of the pioneer sidearm with a falchion. It had a fairly wide, slightly-curved, single-edged blade, with a double-edged tip (the actual term for this escapes me at the moment). I believe these swords were possibly meant to be tools just as much as weapons. These pioneer swords could certainly be a part of the evolution of this type of sword form, if not a direct descendant of the medieval falchion. In medieval times, the falchion was used by all classes of society. It was not just a weapon of the common folk; knights and others of status would occasionally carry a falchion. A falchion was famously used by the Mayor of London, William Walworth, to cut down Wat Tyler during the Peasants' Revolt of 1381. There are actually some rather elaborately decorated falchions of the 16th century - certainly weapons too fine for the "common" folk! I don't know if you could really say that the falchion and messer melded in modern times - there seems to always have been a bit of overlap in the two types, and some early falchions may be called messers due to their hilt form. I guess it all depends on what definition you use. Here are some more examples I have collected over time. Took me a while to dig them up. The first is the sword of Saladin from Codice detto di Giusto, 1435/40, gabinetto Naz. delle Stampe. While a bit later than some of our examples this particular illustration is sometimes referenced as an early example of the knuckle bow appearing. Though I think recent finds have predated this example. The second is an early example I have, it is one from a painted wall in Westminster. this shows a nice example that could be an early form of either. The last are some parts of images from a picture of St Ursula. 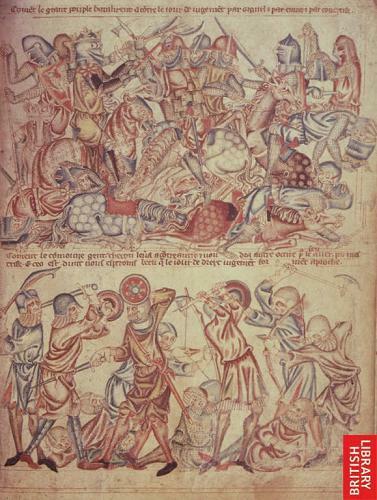 Here you can see the figure on the left with what looks like a messer and two figures on the left with falchions. The archer illustration a nice simple hanger system that seems to be a baldrick with a slide ring. 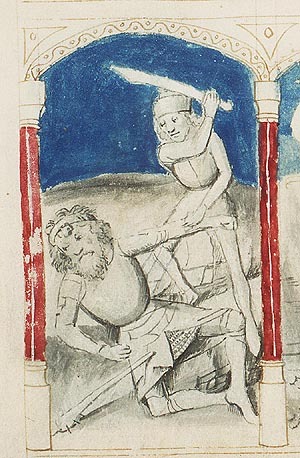 A primitive "knuckle bow", actually more like a "frame" to protect the hand, appears in the images of the knight with the "chopper" from The Romance of Alexander in the Bodleian Library (14th century). This image has been shown before, but I have a detail showing the "chopper" with hand-guard. Knight with chopper from the Romance of Alexander. 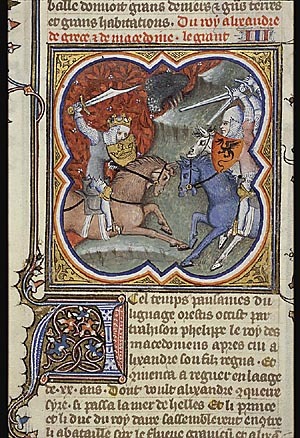 Description: (Miniature) Jason slays the dragon which guards the Golden Fleece. Title of Work: Romance of Jason and the Golden Fleece. Note the shape of the hilt and the rivets visible in the grip. Blade-wise, it's certainly similar to examples of falchions from the same period. Thanks Richard for all the info. I was tryting to put some of that and some images together but did not have enough time. The knife cleaving the saints head is still used by farmers in my area, the handle is traditional. My father in law has one too. That is very interesting. Any chance you could post a picture sometime? Is the piece considered a general tool or does it have a specific purpose it is usually applied to? What area do you find these? While looking through the online images at the web site of the National Library of the Netherlands, I stumbled across yet another period image of a messer (or falchion). It's simpler than some of the others I posted earlier, but the shape of the pommel-end of the hilt suggests that this is indeed a messer. It's dated mid 15th century. 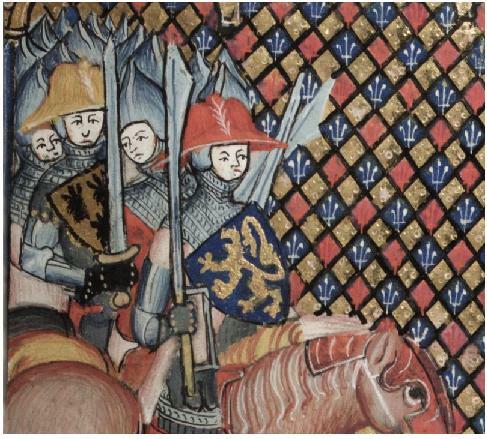 Knights on horseback wielding falchions, from the Romance of Alexander. 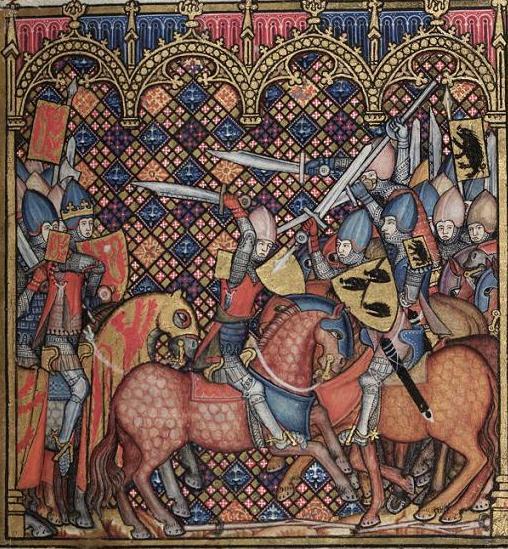 Knights wielding falchions from the Romance of Alexander. LOL I was just doing some research on this topic, here's a wiki page to help you.